These are terms I’d not thought about in a decade since my daughter – now 14 – was in reception (kindergarten) at primary school. But in the aftermath of a recent surgery on my vocal cords, they are now flooding back. I was unable to speak at all for a full three days last week and must rest my voice for the next two weeks. So I am now, at the tender age of …well, never mind, a pre-school teacher’s dream student. As a consummate extrovert – someone who can frequently be found talking to herself when no one else will listen – not speaking is hard for me. But it’s all the harder when I am forced to feel like I still ought to be drinking out of a sippy cup. A case in point. The first night back from surgery, I was watching my favorite French cop show, Spiral, with my husband. Despite being an otherwise rather intelligent man, my husband has difficulty absorbing plot twists rapidly. So every few minutes he would hit “pause” and then I would have to furiously scribble down my explanation for whatever was going on in the show on a piece of paper. Unfortunately – and this hasn’t shifted very much since I was five – my handwriting is quite poor. So my husband could not decipher my graffiti and (silent) conflict would then ensue. It got worse from there. With my two teenagers, I was unable to interrupt/scold/micro-manage/cajole/pick your poison with my usual alacrity. This resulted in me resorting to a variety of hand gestures that were definitely NSFW. I know, I know. Bad parenting. But it’s so much more efficient to deploy the odd chin flick when they fail to do the dishes, than to actually try and express my annoyance longhand. This week, I am thankfully allowed to talk (more) but I am now doing speech therapy. Turns out, the main thing I need to work on is my breathing. When I breathe, far too much of the activity comes from my shoulders and neck, rather than from my diaphragm. It’s actually possible that the stress built up from a lifetime of incorrect breathing caused my voice problem in the first place. To rectify that, I now spend about half of my day blowing bubbles into a glass of water while humming notes and doing scales. Here’s what it sounds like. But this week, all I can say is that I do feel like I belong back in kindergarten. All I’m missing is the art smock and a set of those colorful scissors. “It takes a Village,” Hillary Rodham Clinton once famously wrote. She was referring to how societies can best support children to become able, resilient adults. But I think the same principle might readily be applied to how we care for a rapidly ageing population. I began to turn this over in my mind whilst checking into a recent flight back to America to help my 86 year-old mother move into an “independent living” unit located within a larger retirement village. After years of living in a large house on her own, she’d decided to live in a smaller, more manageable space and with more people around her. When I explained all of this to the British Airways employee checking me into my flight, a look of amazement crossed her face. I went to a funeral not long ago. It was for a family friend, roughly my age, who had killed himself. He left behind a wife and three step-children. It was pretty horrible. And yet, I still found myself pleased to be at his service. I’m not sure if I’m going out on a limb here, but I actually enjoy going to funerals. Sure, they are sad occasions brought on by sad events. But they are also a joyous celebration of life which is at once poignant, edifying and above all, calming. As we get older, we start to fashion our proverbial “bucket lists” – a list of all the things we want to do before we die. I’m not talking here about the small stuff – e.g. losing five pounds, finally visiting Great Aunt Sally on the Upper Peninsula of Michigan. I’m talking about those bigger, more daunting challenges that we set for ourselves because they speak to some deep-seated desire or personal quest. We all have those lists, whether formalized or not. One of my friends wants to run a marathon on all seven continents. (I think he’s up to four or five by now.) Another has sworn that she’ll open her own coffee import/export business. Obviously, every person’s bucket list will be different. So the advice here is really to create your own list and then figure out how you can begin moving towards realizing some of your goals. Tips For Adulthood: Do You Wish You Could Change Your Past? Wow. What a great question. I’ve always believed that regret is a central component of adulthood. But many of our regrets are really longings, so we wouldn’t want to erase them, because they define who we are. In contrast, I love the concept of the etch-a-sketch – that iconic childhood toy – to capture those aspects of our past that we’d truly like to eliminate so that even the vestiges of their imprint don’t remain. So I got to thinking about what would be on my etch-a-sketch list. Here’s what I came up with. I had breakfast recently with two friends in their 70’s. Both have enjoyed very successful professional lives, but are now struggling with how to “give back” in later life. They know what they are good at and would like to share those skills with others, but they are struggling with how to find the right group that shares both their professional interests and feels like a good fit socially. Being on a the board of an organization is all well and good, but they are after something that is much more personal and community-based. As I listened to them speak, it occurred to me that what they’re really talking about is how to cultivate a sense of “belonging,” something that is so naturally achieved through colleagues, religious affiliations, neighborhoods and our kids in earlier phases of adulthood. As we age however, and parents become ill or die, friends move on and our careers wind down, belonging becomes more central to our lives – and more elusive. a. Join a Club – This is obviously the easiest and most immediate way to foster a sense of belonging, by joining a like-minded group of people who share your core interests. While some people think that everything you do in retirement has to have “meaning” and “purpose! (Capital M! Capital P! ), there’s a lot to be said for just getting out there and having some old-fashioned fun. Plus, picking up a hobby in mid-life is good for brain development. Not finding what you want? Start your own club. I once solicited ideas for different “grown up” club ideas on Linked In and was amazed with what came back: an “admin” club where you sit with friends to force yourself through the mound of paperwork on your desk, a “fix-it” collective to repair broken objects and – wait for it! – a “procrastinators club” where you actually put some money down to inspire yourself – and others – to tackle a long-delayed life project. b. Go Online – If you’re not finding something that sparks a sense of belonging locally, go online. Not all boomers are comfortable on the internet, but seniors who use the internet report higher levels of life satisfaction than seniors who do not. I’ve personally been delighted to discover the treasure trove of websites devoted to establishing a sense of community and identity for those of us in the “second half of life,” which range from more journalistic sites like Next Avenue that provide news and information relevant to America’s booming aging population, to health and wellness sites aimed at more niche audiences, such as Sixty and Me (women) or OlderBeast (men). c. Volunteer – If I sounded above like I dismiss the value of volunteer work as we age, I don’t. We know that volunteering as you age can be good for both your physical and your mental health. The two friends I had breakfast with were particularly keen to find places where they could utilize the skills they’d amassed over a lifetime of work and make those useful for other people. Fortunately, they are tapping into a zeitgeist as organizations like Encore.org and Re-Serve are all about fostering this sort of inter-generational learning. d. Do A Gap Year – Until recently, the concept of a “gap year” was almost entirely confined to the U.K. It’s an (optional) year right after high school and before college when 18 year-olds go out and explore – literally, by travelling, or more figuratively, by working/volunteering/ or simply puzzling through what the next phase of adulthood might offer. I’m quite drawn to the idea of gap years for grown ups as a time to do volunteer work, learn a new skill, or immerse oneself in a foreign culture. For those struggling with how to find belonging, this outside-the-box strategy might just do the trick. e. Go To A Conference – Finally, if all else fails, belonging might come about through simple, old-fashioned networking. There are a variety of conferences springing up aimed specifically at the aging set, whether those are about fostering creativity or understanding the business side of the “longevity economy.” Pick your passion and register now! I had a birthday recently. It wasn’t *that* birthday. But that one’s coming soon enough. So while I’m fully on board with Joanne Bamberger’s recent post about how it’s really OK to look 50, there’s no denying that as we age, things start to change. Once, several years ago I wrote a blog post entitled “Five Tangible Signs You’re Middle Aged.” I looked at it again recently and decided that while it was (still) remarkably relevant, it was time to expand on it and bring it up to date. I don’t know about you, but I think most of us could use some good news right about now. As this whole government shut down thing threatens to drag on into yet another week – with debt ceilings looming – I’m looking anywhere and everywhere to have a positive outlook on life. So I’ve been reassured by a spate of recent research suggesting that whatever our politicians can or cannot achieve when locked in a room together, the rest of us can at least know that aging doesn’t necessarily need to further our sense of despair. To the contrary, some things really do get better. 1. Productivity peaks later in life. Worried that as you get older, you won’t be as sharp as the new kid on the block in the cubicle next to you? Fear no more. Recent research out of Finland suggests that most workers maintain their mental and social work skills throughout their lives. Provided that you stay healthy, there’s no reason that you can’t keep up with the demands of work well into later life. And it gets better. In America, anyway, you’re likely to earn more as you age. And that’s because – as a recent Brookings study shows – today’s older workers are much better educated than older workers in the past. Indeed, older Americans who stay attached to the labor force after 62 are much more likely to have received schooling after high school than the workers who retire at younger ages. And we all know that there are returns to education. So don’t worry that you may not know what Pinterest is. You’ve got plenty on those youngins. 2. Happiness peaks later in life. Of course, all work and no play makes Jack a dull boy. (Ditto Jane.) So it’s equally reassuring to learn – courtesy of the Financial Times‘ Tim Harford – that we’ll actually have more fun as we get older as well. Economists who study “subjective well being” have long been aware of a U-shaped pattern as people pass through different ages. What this essentially means is that we are, on average, happier in our teens and in early adulthood, and as pensioners, than we are in middle age. Recent research out of Germany posits one explanation for this U-shaped curve and it has everything to do with…um…great expectations (to coin a phrase). Turns out, younger people vastly inflate their expectations of what life will deliver five years on, such that by the time you’re (cough) my age, you’re basically depressed by all that you haven’t achieved. By the time you get old, however, you start to be pleasantly surprised by what you *have* accomplished, rather than by what you’ve failed to do. This finding is consistent with other recent studies in the U.S. which suggest that as we age, how we define happiness changes, from a notion that is entirely bound up in achieving more (so-called “promotion-mindedness” to one that’s more about valuing what we already have.) While I’ll still fess’ up to wanting to write that best-selling novel, it’s reassuring to know that one day, the draft sitting within my desk drawer will give me a certain solace. Read the rest of this post over at The Broad Side…. Tips For Adulthood: What Would You Erase From Your Life? On Wednesdays, I offer tips for adulthood. 1. Smoking. Yes, it’s true. I was a smoker for several years of my life. For a long time, it was just a social thing I did a few times a week with my friends when we were out drinking. This was college, after all, and our entire lives lay ahead of us. Who really thought about mortality? But then, during my first year of graduate school, I actually became a smoker. You know, one of those people who woke up in the morning and not terribly long after awakening, felt the need to have a cigarette. Boy, I wish I could erase that phase of my life. Because with what we now know about smoking – and its effects not only on our own health, but on those around us – I fully appreciate why my mother burst into tears when I announced to her that I was a smoker. 2. Not being an athlete. I’ve never been much of an athlete. As I’ve frequently bemoaned , during my childhood I was really only ever good at bowling and pool. In fact, the only time I was ever actively solicited to join a sports team was when – during the orientation session during my Freshman year at college – some large, extremely fit blond creature ambled over and – no doubt hearing my rather loud voice and observing my less-than-commanding frame – asked if I’d ever thought about being a coxswain for the crew team. (Um, honey? I’ve never heard the term coxswain before you just uttered it but…um…no?) But in light of all the benefits sports have for kids – particularly girls – I now wish that I’d pushed myself to do more to participate in sports when I was young, even without being good at them. 3. My perm. Much like smoking, another erase-worthy event in my life is that permanent I had back in high school. We all have our hair issues, God knows. My own stem from my baldness and perennial wish that I could have more body in my hair than that one, isolated cowlick in that upper, front-left corner of my scalp. And so, during a brief period in high school, I sported a perm. I wish I could show you a picture – so that you might cringe along with me – but suffice to say that it wasn’t a pretty picture. My friends in college called it “The Jersey Flip” to convey that singular hideousness that is often attributed to my home state. 4. Not pursuing journalism earlier. Although I’m a big believer that figuring out what you want to do with your life professionally takes a lot of time and thought, I really wish that I’d become a journalist earlier on in life. I think that if I’d known myself better – or, better put – trusted myself more – I would have realized earlier on that journalism combined many of my passions in life, including writing, travel and, above all, analyzing people. I’m particularly drawn to the romantic image of the 20-something foreign correspondent in a war-torn country, dodging bombs and filing stories with a glass of bourbon at hand, a la Shutter Babe or The Year of Living Dangerously. Maybe it wouldn’t have been quite so romantic in real life, but it’s one of those things I really wish I could go back and do over. 5. Him. Oh, c’mon. We all have one. How about you? What would you go back and erase from your past? 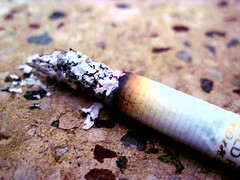 Image: Cigarette by Sudipto_Sarkar via Flickr under a Creative Commons license. I’ve always loved weddings. When I was younger, I saw them as a giant, free party. And I still do. But as I age – and move out of the wedding phase of life and into the era when everybody starts getting divorced – I don’t go to all that many weddings anymore. So when I do – as I did some weeks back – they are a real source of rejuvenation for me personally. There are the obvious reasons for this: true love, the pageantry, Pachelbel’s Canon etc. 1. Dancing – I’ve loved the weddings I’ve gone to in a friend’s basement as much as the ones I’ve gone to that took over an entire hotel. At the end of the day, it’s all about the people. But I must say that if you haven’t gone out dancing in a while – (and let’s be honest, who does that after they hit 40?) – boy, is it fun to go to someone else’s dancing party. At the wedding I attended recently, there was a large age spread among the guests. So the DJ went out of his way to alternate a bunch of contemporary music – which brought out my teen-aged nieces and nephews – with some classic music that got the – ahem – older crowd out there. I mean, seriously. Come On, Eileen followed by Twist and Shout? What’s not to love? 3. Socializing – Yes, as I age I’m all in favor of hanging out in smaller groups. But once in a while it’s exhilarating to enter a room with 100 people and…mingle. At the wedding I went to recently, I spoke with friends from high school, relatives ranging from 3 to 83, and complete strangers. My favorite guest was one of my nephew’s friends, a 20 year-old guy who kept repeating the phrase “I’m just here to have fun” and became the Zelig of the entire event, appearing in every photo and dancing to every tune. I dubbed him “random party guy” and kept circling back to check in on him throughout the weekend. 5. 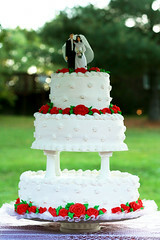 Cake – I will not pretend otherwise that my favorite dessert on earth is wedding cake. If at heart you have the dietary preferences of an 11 year-old boy, it gets no better than this.